Israeli forces continued with systematic crimes, in the occupied Palestinian territory (oPt), for the week of 03 – 09 January, 2019. Israeli forces continued to use excessive force against peaceful protestors in the Gaza Strip. 56 civilians, including 10 children, 3 women, 5 journalists, and 6 paramedics, were wounded; the injury of one of them was reported as serious. Ten civilians, including 4 children, a woman and a paramedic, were wounded, in the West Bank. In the Gaza Strip, the Israeli forces continued to use lethal force against the participants in the peaceful protests organized along the Gaza Strip borders, which witnessed the peaceful protests for the 41th week along the eastern and northern border area of the Gaza Strip. Moreover, the Israeli forces use force against civilians who participate in demonstrations during the Israeli incursions in the West Bank. In the Gaza Strip, the Israeli forces wounded 56 civilians, including 10 children, 3 women, 5 journalists and 6 paramedics. The injury of 1 of those wounded was reported serious. In the West Bank, the Israeli forces wounded 10 civilians, including 4 children, a woman, a journalist, and a paramedic. 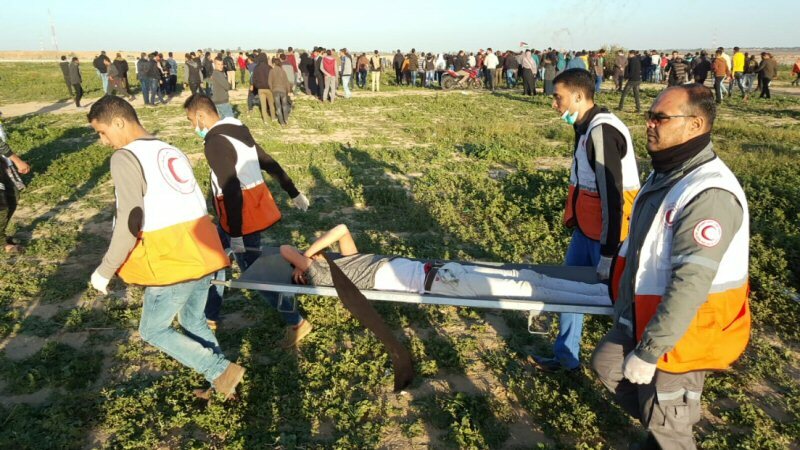 As part of using excessive force against the peaceful protesters along the Gaza Strip borders, during the reporting period, Israeli forces wounded 56 civilians, including 10 children, 3 women, 5 journalists, and 6 paramedics. The injury of 1 of those wounded was reported serious. As part of targeting the border areas, on 03 January 2019, Israeli soldiers stationed along the border fence between the Gaza Strip and Israel, east of al-Showka village, east of Rafah, opened fire at a checkpoint belonging to the field border control officers. The soldiers also opened fire at Palestinian shepherds. On 05 January 2019, Israeli soldiers stationed along the border fence between the Gaza Strip and Israel, east of Dir al-Balah, in the center of the Gaza Strip, opened fire at Palestinian shepherds. On 06 January 2019, Israeli forces stationed in a military watchtower, east of Jabalia, north of the Gaza Strip, opened fire at agricultural lands in the border areas between the Gaza Strip and Israeli. On the same day, the Israeli forces opened fire at agricultural lands, east of al-Na’imah Street, east of Biet Hanoun, north of the Gaza Strip. On the same day, the Israeli forces opened fire at agricultural lands, east of Gaza’s valley in the central Gaza Strip. They also opened fire at the field border control officers and agricultural lands, east of al-Showka village, east of Rafah, but no casualties were reported. On 07 January 2019, Israeli soldiers opened fire at agricultural lands, east of al-Shawka village, east of Rafah. As part of the airstrikes, on 06 January 2019, Israeli helicopters fired 2 missiles at a military site belonging to the Palestinian armed groups, adjacent to the border fence with Israel, east of Khuza’a, east of Khan Yunis, but no casualties were reported. On 07 January 2019, Israeli warplanes separately fired 3 missiles at ‘Asqalan military site belonging to al-Qassam Brigades ( the armed wing of Hamas Movement) in al-Sifa area, northwest of Beit Lahia, north of the Gaza Strip, but no casualties were reported. In the West Bank, during the reporting period, Israeli forces wounded 10 Palestinian civilians, including 4 children, a woman, a journalist, and a paramedic, in separate shooting incidents. During the reporting period, Israeli forces conducted at least 82 military incursions into Palestinian communities in the West Bank and 2 similar incursions into Jerusalem and its suburbs. During those incursions, Israeli forces arrested at least 47 Palestinians, including 14 children, in the West Bank. Moreover, 2 others were arrested in Jerusalem and its suburbs. In the Gaza Strip, on 04 January 2019, Israeli forces moved 100 meters into al-Shawka village, east of Rafah, south of the Gaza Strip. They patrolled the area and placed barbed wires that is around 50 meters away from the border fence with Israel. On 07 January 2019, Israeli forces moved 100 meters into the southern side of border fence with Israel in Abu Samra area, north of Beit Lahia, north of the Gaza Strip. On the same day, the Israeli forces moved 100 meters into eastern Dir al-Balah in the central Gaza Strip. On 08 January 2019, the Israeli forces moved 100 meters into Abu Samra area amidst Israeli sporadic shooting. As part of settlement crimes and demolitions, on 03 January 2019, Israeli forces uprooted and damaged 50 olive trees planted in 3 dunams al-Ba’aan area, which belong to Bruqeen village, west of Salfit. The Israeli forces claimed that, according to the Ottoman law, the land’s ownership was shifted to become State’s territory, as they were not planted for 10 consecutive years. The land belongs to Ziad Barakat Abu Zaid. As part of the Israeli settlers’ attacks against the Palestinians civilians and their property, on 03 January 2019, a group of Israeli settlers attacked a vehicle at the entrance to “’Ofra” settlement, east of Ramallah, and damaged its left rear window. On 04 January 2019, a group of Israeli settlers, from “Yatizhar” settlement, moved into al-Safafeer area in the eastern side of ‘Oreef village, south of Nablus, under the Israeli forces’ protection. The settlers threw stones at ‘Oreef Secondary School. On 06 January 2019, a group of Israeli settlers, from “Asfar” settlement, uprooted 60 olive seedlings planted 3 years ago in the northeast of al-Shayyoukh village, north of Hebron. The seedlings were planted in 320 dunum belonging to the heirs of the late Mousa Ahmed ‘Ayaydah. On 08 January 2019, a group of settlers cut 15 olive trees planted 15 years ago in al-Hamra area, east of Yatta City, south of Hebron. They also wrote racist slogans on walls such as Death for Arabs and Revenge. The 15 tress belong to Mohammed Sulaiman Rab’ey from At-Tuwani village. Gaza City: Israel forces wounded 15 civilians, including 3 journalists. Seven of them were shot with live bullets and 6 with rubber bullets, while 2 were directly hit with tear gas canisters. The wounded journalists were identified as Ahmad al-Halaby, who works at Kan’an News Agency , was hit with a rubber bullet to the head and with a tear gas canister to the chest; and Mo’een Tayseer Ahmad al-Dabah (31), who works at Palestine Today News Agency, was hit with a tear gas canister to the face. Northern Gaza Strip: Israeli forces wounded 15 civilians, including 5 children, a woman, a paramedic and a photojournalist. 14 of them were hit with tear gas canisters and a child was hit with a live bullet. The wounded paramedic was identified as Mohammad Jehad Abu al-Kashef (25), who works with Palestinian Medical Relief Society as a volunteer paramedic and was hit with a tear gas canister to the left leg. The wounded journalist was identified as Moahmmad Atef Mohammad al-‘Arbeed (23), who works with Shehab News Agency and was hit with a tear gas canister to the left thigh. Central Gaza Strip: Israeli forces firing live bullets and tear gas canisters, which continued until approximately 17:00, resulted in the injury of 7 protestors, including 2 children, a woman, and 2 paramedics, with direct tear gas canisters. The wounded paramedics were identified as Diab Younis Diab al-Azaiza (31), who is from Deir al-Balah and works at the Ministry of Health; and Ahmad Mahmoud Abed al-Raouf Qa’dan (27), who is from al-Zawayda and works as a volunteer paramedic at Palestine Red Crescent Society (PRSC). Khan Younis: Israeli forces wounded 7 civilians, including a journalist and 2 paramedics. The wounded journalist was identified as Mohammad Khader ‘Abed Raboh Z’orob (23), from El-Mawasi area in Khan Younis, and was hit with a tear gas canister to the chest; while the 2 wounded paramedics were identified as Mostafa ‘Emad al-Sonwar (22), who was hit with a tear gas canister to the right thigh, and Mohammad Sobhi Abu Ta’mia, who was hit with a tear gas canister to the head. The both paramedics work as volunteers in Elite Medical Team. Rafah: 11 civilians, including 2 children and a paramedic, were wounded. Seven of them were hit with live bullets and shrapnel, 4 of them were directly hit with tear gas canisters. The wounded paramedic namely Mohammad Saleh Ahmad al-Sheikh ‘Eid (28) was hit with a tear gas canister that fell over an ambulance belonging to the Ministry of Health. The injury of one of them was reported as serious. At approximately 15:30 on Sunday, 6 January 2019, Israeli forces stationed along the border fence with Israel in the Central Gaza Strip, opened fire at a number of demonstrators who were 100-150 meters away from the border fence of the Return Camp, east of Bureij. As a result, a 13-year-old child, from Bureij camp, was hit with a live bullet to the head and was then taken to al-Aqsa Hospital in Dir al-Balah. He was referred to al-Shifa Hospital in Gaza City. On 04 January 2019, following the Friday prayer, dozens of Palestinian civilians and defenders of international human rights organized a peaceful demonstration against settlement in al-Mughair village, northeast of Ramallah. Israeli forces stationed near the village main entrance fired live and rubber bullets, tear gas canisters and sound bombs at the demonstrators. As a result, 2 children were wounded; the first one (17) was hit with a two-two bullet to the foot and the second (16) was hit with a two-two bullet to the foot as well. On Monday, 07 January 2019, Israeli forces accompanied with the Israeli Municipality staff raided a house belonging to prisoner Samer Tareq al-‘Issawiy in al-‘Issawiyia village, northeast of occupied East Jerusalem. The municipality staff took the house measures without giving any reasons. Tareq said that the Israeli municipality imposed high fines on the family during previous years under the pretext of non-licencing. Moreover, the house of Tareq’s son, Ra’fat, was destroyed when his brother Samer was in a hunger strike in the Israeli jails. On Monday, Israeli forces arrested Feras al-Debis, Media and Public Relation Officer at the Islamic Endowments Department, while walking on Nablus Street in occupied Jerusalem. His arrest was extended for a week. At approximately 02:30, Israeli forces moved into al-‘Issawiyia village, northeast of occupied Jerusalem. They raided and searched a house belonging to Saieb Derbas and then arrested him. At approximately 80:30 on Thursday, 03 January 2019, a group of Israeli settlers, under the Israeli forces’ protection, attacked a Palestinian vehicle at the entrance to “ ‘Ofra” settlement, east of Ramallah, and damaged its left windshield. The damaged vehicle belongs to Fahd Taysser Faieq Safadi, from ‘Oreef village, south of Nablus. It should be noted that the vehicle was heading to Ramallah with the driver Ibrahim Hussain Kayid Sabbah (22), from ‘Oreef village. At approximately 16:30 on Friday, 04 January 2019, a group of Israeli settlers, from “Yatizhar” settlement, and under the Israeli forces’ protection moved into al-Safafeer area in the eastern side of ‘Oreef village, south of Nablus. The settlers threw stones at ‘Oreef secondary school. Meanwhile, a group of Palestinian young men gathered and confronted the Israeli settlers and soldiers. The Israeli forces then fired live and rubber bullets and tear gas canisters at them. As a result, ‘Abdullah Sa’oud Mahmoud Asmar (11) was hit with a rubber bullet to the foot and was then taken to Rafidia Hospital in Nablus, where doctor classified his injuries as moderate. Moreover, the Israeli forces arrested Mahmoud Zahi Radi Sheheda (16). When Mahmoud’s father headed to the area to help his son and stepped out of his vehicle, an Israeli soldier fired a rubber bullet at the vehicle rear window and damaged it. As a result, Mahmoud’s father were forced to leave the area. At approximately 23:00 on the same day, the Israeli forces released Mahmoud in Hawarah plain and then he headed to Hawarah village and asked one of its residents to call his father. On Sunday, 06 January 2019, a group of Israeli settlers, from “Asfar” settlement, uprooted 60 olive seedlings planted 3 years ago in the northeast of al-Shayyoukh village, north of Hebron. The seedlings were planted in 320 dunum belonging to the heirs of the late Mousa Ahmed ‘Ayaydah. Al-‘Ayaydah family’s lands are in a valley that is bordered to the northeastern by “Bani Kadim“ settlement and to the west and south by “ Asfar” settlement and an Israeli camp “Motsadah”. Israeli settlers established “Asfar” settlement in early 1980s on the lands of al-Shayyoukh and Sa’ir villages. In 1990s, the settlers established “Bani Kadim“ settlement on the lands of the abovementioned villages. Part of this settlement was established on the lands belonging to ‘Ayaydah family, where the settlers set up mobile houses on 12 dunums of the family lands. it should be noted that in August 2014, the Israeli authorities issued a military order No. (14/21/T) titled: “ An order to seize lands”. This order was for parts of ‘Ayaydah family lands. The family members challenged the order and hired a lawyer to defend their lands. The Israeli liaison told them that they will give them a permit to enter their lands and work in them, but the family members refused the Israeli liaison offer, clarifying that they own these lands as absolute ownership and they do not need permits to enter their lands. The family members received an oral notice that allowed them to enter their lands after refusing to get permits. The family members started working in their lands, reclaimed them in August 2014, and planted them with olive seedlings donated by Young Men’s Christian Association (YMCA). On 17 February 2015, the Israeli settlers uprooted 550 olive seedlings planted in the threatening lands, but the lands owners planted them again with 1200 seedlings. On 28 March 2015, the Israeli settlers uprooted and stole the abovementioned seedlings again. On 13 January 2018, 2 olive trees planted years ago were burned. On 08 September 2018, thirty olive trees planted 35 years ago were cut and damaged. On 25 September 2018, 3 olive trees were cut and damaged. On 15 August 2013, 10 olive trees planted years ago were cut. On 15 September 2012, 27 olive trees were cut. On 25 August 2012, 31 olive trees planted years ago were cut. These attacks came at the time that the Israeli authorities aim at expanding “Ma’oun” settlement as the Israeli Civil Administration declared on 16 June 2016 in al-Quds newspaper that it has set a plan (1/1/508) in favor of “Ma’oun” settlement. This plan modifies open agricultural areas and a part of residential area or a to-be-established road into an industrial area, buildings, public institutions, and suggested roads. “Ma’oun” settlement was established in 1981 by “Gush Amunium” organization on lands confiscated from al-Tuwani village and Kherbet Sadet al-Th’ala. The settlement plan (508) is estimated at 385 dunums confiscated from Yatta City.